These parasites are transmitted from person to person by female Anopheles mosquitoes throughout tropical and subtropical regions throughout the world and can be contracted by shared needles, blood transfusions or transplacenta infections. When the infected mosquito bites, it inject plasmodium sporozoites into the bloodstream. This sporozoites migrate through the blood to the liver. In the liver, they form cyst-like structure containing thousands of merozoites. 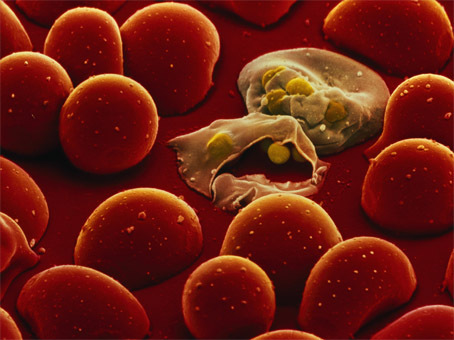 Upon release, each merozoites invades a red blood cell (RBC) and becoming a trophozoite. This trophozoites used the haemoglobin in the RBC as their nutrient. The trophozoites multiply and become merozoites. Eventually, the RBC will ruptures and release the merozoites. 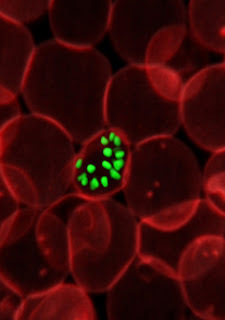 Some of this merozoites can enter another RBC to repeat the cycle and some of them become the gametocytes which be picked up by the female mosquito. In the mosquito, the gemetocytes undergo the sexual cycle to form the sporozoites that will be used to infect another human. Malaria has taking the lives of almost one million people a year, most of them in sub-Saharan Africa and under the age of 5. It is the fifth leading cause of death worldwide and almost half the world’s population (3.3 billion) is at risk. The effectiveness of a drug treatment is related to the particular species of infecting plasmodium and the stage of its life cycle that is targeted. In many warm, tropical areas of the world, it is endemic. Although its range has diminished, the global warming has threatens to expand it once again. 7. Harvey R.A, Champe P.C. (2009) Lippincott’s illustrated reviews : Pharmacology 4th edition, 421.